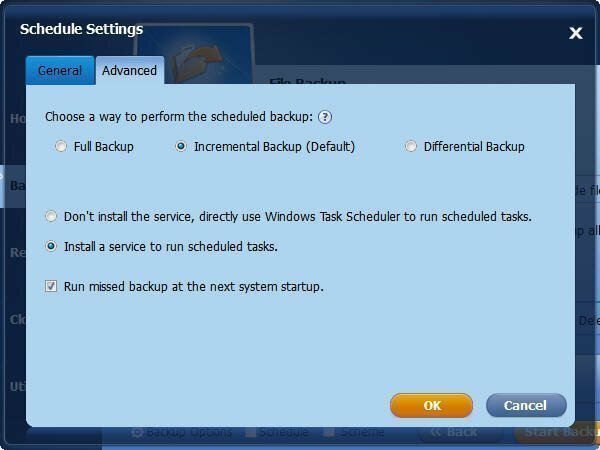 How to Do Incremental and Differential Backup for Windows 10? If you have backed up for your important data, but there is some changed or added files, how to do? Doing incremental and differential backup in Windows 10 may be a wise choice. When referring backup, you should know some information about full backup, incremental backup and differential backup. But what are the differences among them? Full backup means to backup all the data for important files, or applications etc. It will take more space on the destination place, because every time you make a full backup, all data will be backed up no matter it changed or not. Thus, It will take a lot of time to execute a task, and there will be a lot of same files exsting in full backup. Incremental backup refers to backup the changed and added data since the first full backup or the last backup. Namely, the first incremental backup is on the basis of the first full backup to backup the increased and modified files; and the second incremental backup is based on the first incremental backup. So, there is no repetitive backup data, and the amount of data backup is smaller than Full backup. But recovery from incremental backups is very troublesome, and you must own the first full backup and all the incremental backups, in addition, they must be restored by the chronological order one by one, which would take a lot of time. Incremental backup refers to backup the changed or added data since the last backup. While differential backup is backing up the changed data based on the last full backup. the differential backup will spend less backup time and can save disk space in maxmium. After knowing these backup types, you can do incremental and differential backup Windows 10/8.1/8/7/XP/Vista according to your own needs. How will you to create Windows 10 incremental and differential backup? Widows 10 has the backup tools like Backup and Recovery, that you can use for creating system image, and backup folders/files freedom, and you will only ever have a single copy of the file backed up which will be the most recently backed up version. It also has the function File History, that only backups personal files/libraries. File History backups are non-destructive and are neither incremental, nor differential. They are simply full copies of the original file that are copied from the source to the destination with a time-stamp added to the file name. They can be browsed and copied the same the original files can be. In time, you may find that you have multiple copies of the same file at different stages of it's progression, any one of with can be restored manually via copy/paste, or via the File History GUI. However, both tools in Windows 10 cannot do incremental backup or differential backup. Thus, if you need to do incremental and differential backup Windows 10, you need to take use of third party software. For Windows 10 incremental and differential backup, the AOMEI Backupper Standard, should be the best third party software. AOMEI Backupper provides you four types of backup, System Backup, Disk Backup, Partition Backup, and File Backup. And you can set up incremental backup or differential backup for Windows 10 in each back up with a few simple steps. Before you do, there are some things you need to know first. Both incremental backup and differential backup are base on full backup. 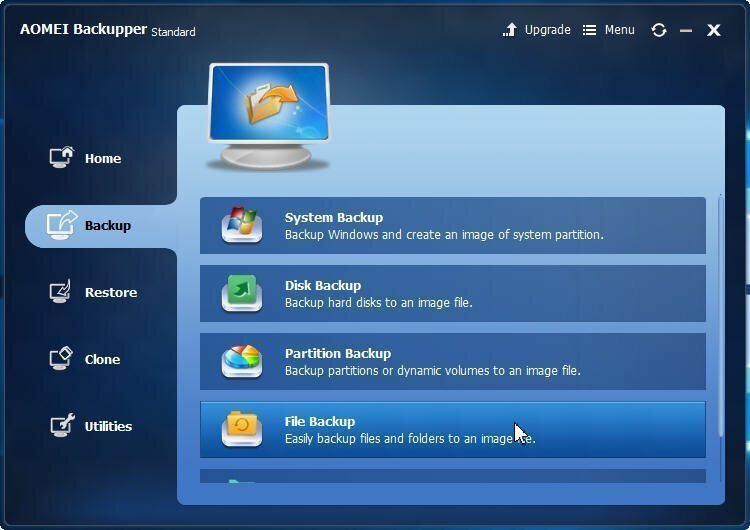 You need to do a full backup at the first neither you create incremental backup nor differential backup in Windows 10. AOMEI Backupper allows you to set up full backup, incremental/differential backup during backup. But if it is the first backup, it will execute full backup. AOMEI Backupper Standard is free to Windows 10/8/7/Vista/XP. If you are Windows Server users, AOMEI Backupper Server is suitable for you. 1. Free download AOMEI Backupper Standard. Install and launch it. Here we will take file backup as an example. Click Backup->File Backup. 2. Select the files/folders you need to backup in “Step1”, then, select a drive as the destination disk to store your backup. Here is D: drive. After thus, you click Start Backup to launch the progress. 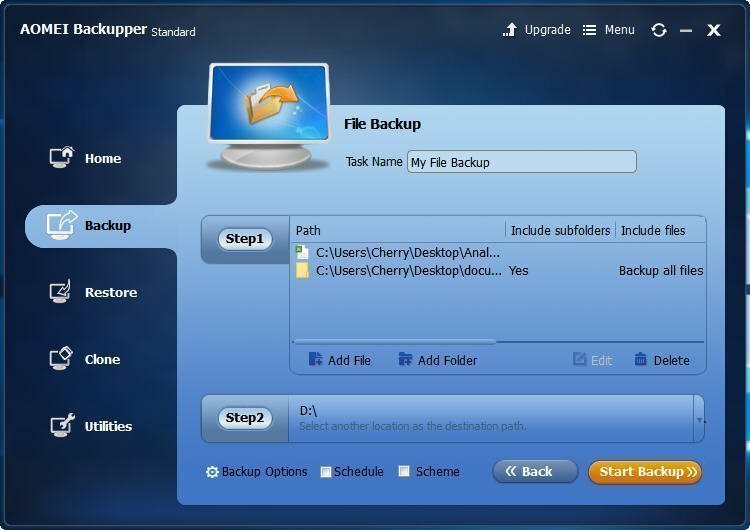 You can backup files with a certain file extension if you upgrade to AOMEI Backupper Professional or superior edition. Before you clicking Start Backup, you can click Schedule to set up incremental and differential backup for Windows 10. When you click Schedule, it will pop up a window like the following screenshot. Click Advanced, and you can choose to do incremental or differential backup here. 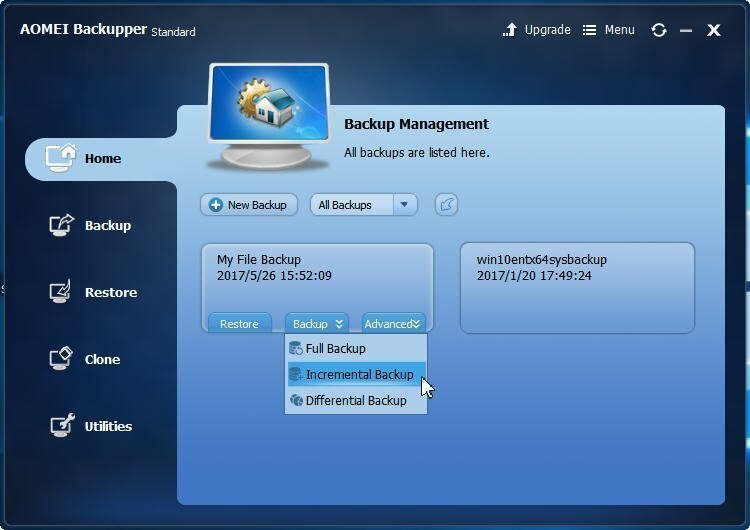 In the General tab, you can setup an automatic backup files in daily, weekly, monthly, and event triggers (only existing in AOMEI Backupper Professional and superior versions). 3. Then, you can click Start Backup to execute incremental/differential backup in Windows 10. Otherwise, you can set it up in the Home tab. Like this, you have finished a full backup and will turn to Home table. A period of time later, if you add new data to this full backup, you can do incremental and differential backup for the new data in another way. Click Backup>Incremental Backup or Differential Backup according to your needs. In conclusion, AOMEI Backupper Standard can help you easily finish creating incremental and differential backup Windows 10. Besides, it can help you restore files in a quick way.